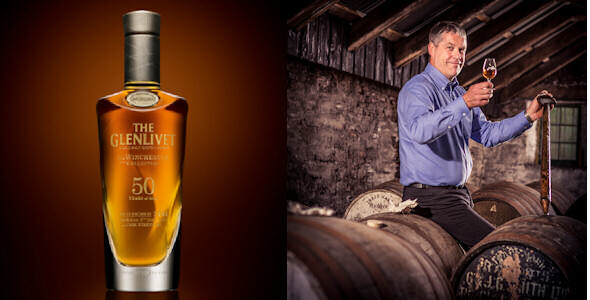 The Glenlivet Winchester Collection | 50 Years Of Craft Comes To Life With The Glenlivet Winchester Collection | Read Alan Winchester thoughts in his Q&A's about "Vintage 1964". October marks the inaugural release from The Glenlivet Winchester Collection: the world’s first series of rare and precious 50 year old single malt Scotch whiskies from the single malt that started it all. “Vintage 1964” is the first release from this exquisite collection, anticipated to become one of the most sought after and priceless whisky collections on the planet. Just 100 bottles of this remarkable Speyside single malt, priced at $25,000 each, will go on sale around the world, with the very first bottle – Bottle No 1 – going on sale at one of the world’s most prestigious retailers, Harrods, from this October. An undisclosed number of further releases from The Winchester Collection will then follow, with “Vintage 1966” confirmed to be next in line. To mark the release, we look at the investment value of whisky with Bonhams, consider other significant milestones from 1964 and speak to Master Distiller Alan Winchester.